"R&B" and "RnB" redirect here. For the modern style of music also called "R&B", see Contemporary R&B. For the Japanese television station that uses the abbreviation RNB, see Nankai Broadcasting. The term "rhythm and blues" has undergone a number of shifts in meaning. In the early 1950s, it was frequently applied to blues records. Starting in the mid-1950s, after this style of music contributed to the development of rock and roll, the term "R&B" became used to refer to music styles that developed from and incorporated electric blues, as well as gospel and soul music. In the 1960s, several British rock bands such as the Rolling Stones, the Who and the Animals were referred to and promoted as being R&B bands; posters for the Who's residency at the Marquee Club in 1964 contained the slogan, "Maximum R&B". Their mix of rock and roll and R&B is now known as "British rhythm and blues". By the 1970s, the term "rhythm and blues" changed again and was used as a blanket term for soul and funk. In the 1980s, a newer style of R&B developed, becoming known as "contemporary R&B". It combines elements of rhythm and blues, pop, soul, funk, hip hop, and electronic music. Popular R&B vocalists at the end of the 20th century included Prince, R. Kelly, Stevie Wonder, Chaka Khan, Whitney Houston, and Mariah Carey. In the 21st century, R&B has remained a popular genre becoming more pop orientated and alternatively influenced with successful artists including Usher, Bruno Mars, Chris Brown, Justin Timberlake, The Weeknd, Frank Ocean and Khalid. Writer and producer Robert Palmer defined rhythm & blues as "a catchall term referring to any music that was made by and for black Americans". He has used the term "R&B" as a synonym for jump blues. However, AllMusic separates it from jump blues because of R&B's stronger gospel influences. Lawrence Cohn, author of Nothing but the Blues, writes that "rhythm and blues" was an umbrella term invented for industry convenience. According to him, the term embraced all black music except classical music and religious music, unless a gospel song sold enough to break into the charts. Well into the 21st century, the term R&B continues in use (in some contexts) to categorize music made by black musicians, as distinct from styles of music made by other musicians. Louis Jordan in New York City, c. July 1946 (William P. Gottlieb 04721). The migration of African Americans to the urban industrial centers of Chicago, Detroit, New York City, Los Angeles and elsewhere in the 1920s and 1930s created a new market for jazz, blues, and related genres of music. These genres of music were often performed by full-time musicians, either working alone or in small groups. The precursors of rhythm and blues came from jazz and blues, which overlapped in the late-1920s and 1930s through the work of musicians such as the Harlem Hamfats, with their 1936 hit "Oh Red", as well as Lonnie Johnson, Leroy Carr, Cab Calloway, Count Basie, and T-Bone Walker. There was also increasing emphasis on the electric guitar as a lead instrument, as well as the piano and saxophone. In 1948, RCA Victor was marketing black music under the name "Blues and Rhythm". In that year, Louis Jordan dominated the top five listings of the R&B charts with three songs, and two of the top five songs were based on the boogie-woogie rhythms that had come to prominence during the 1940s. Jordan's band, the Tympany Five (formed in 1938), consisted of him on saxophone and vocals, along with musicians on trumpet, tenor saxophone, piano, bass and drums. Lawrence Cohn described the music as "grittier than his boogie-era jazz-tinged blues". :173 Robert Palmer described it as "urbane, rocking, jazz-based music with a heavy, insistent beat". Jordan's music, along with that of Big Joe Turner, Roy Brown, Billy Wright, and Wynonie Harris, is now also referred to as jump blues. Already Paul Gayten, Roy Brown, and others had had hits in the style now referred to as rhythm and blues. In 1948, Wynonie Harris' remake of Brown's 1947 recording "Good Rockin' Tonight" reached number two on the charts, following band leader Sonny Thompson's "Long Gone" at number one. In 1949, the term "Rhythm and Blues" replaced the Billboard category Harlem Hit Parade. Also in that year, "The Huckle-Buck", recorded by band leader and saxophonist Paul Williams, was the number one R&B tune, remaining on top of the charts for nearly the entire year. Written by musician and arranger Andy Gibson, the song was described as a "dirty boogie" because it was risque and raunchy. Paul Williams and His Hucklebuckers' concerts were sweaty riotous affairs that got shut down on more than one occasion. Their lyrics, by Roy Alfred (who later co-wrote the 1955 hit "(The) Rock and Roll Waltz"), were mildly sexually suggestive, and one teenager from Philadelphia said "That Hucklebuck was a very nasty dance". Also in 1949, a new version of a 1920s blues song, "Ain't Nobody's Business" was a number four hit for Jimmy Witherspoon, and Louis Jordan and the Tympany Five once again made the top five with "Saturday Night Fish Fry". Many of these hit records were issued on new independent record labels, such as Savoy (founded 1942), King (founded 1943), Imperial (founded 1945), Specialty (founded 1946), Chess (founded 1947), and Atlantic (founded 1948). Bartholomew referred to the Cuban son by the misnomer rumba, a common practice of that time. Fats Domino's "Blue Monday," produced by Bartholomew, is another example of this now classic use of tresillo in R&B. Bartholomew's 1949 tresillo-based "Oh Cubanas" is an attempt to blend African American and Afro-Cuban music. The word mambo, larger than any of the other text, is placed prominently on the record label. In his composition "Misery," New Orleans pianist Professor Longhair plays a habanera-like figure in his left hand. The deft use of triplets is a characteristic of Longhair's style. Gerhard Kubik notes that with the exception of New Orleans, early blues lacked complex polyrhythms, and there was a "very specific absence of asymmetric time-line patterns (key patterns) in virtually all early-twentieth-century African American music ... only in some New Orleans genres does a hint of simple time line patterns occasionally appear in the form of transient so-called 'stomp' patterns or stop-time chorus. These do not function in the same way as African time lines." In the late 1940s, this changed somewhat when the two-celled time line structure was brought into the blues. New Orleans musicians such as Bartholomew and Longhair incorporated Cuban instruments, as well as the clave pattern and related two-celled figures in songs such as "Carnival Day," (Bartholomew 1949) and "Mardi Gras In New Orleans" (Longhair 1949). While some of these early experiments were awkward fusions, the Afro-Cuban elements were eventually integrated fully into the New Orleans sound. Robert Palmer reports that, in the 1940s, Professor Longhair listened to and played with musicians from the islands and "fell under the spell of Perez Prado's mambo records." He was especially enamored with Afro-Cuban music. Michael Campbell states: "Professor Longhair's influence was ... far reaching. In several of his early recordings, Professor Longhair blended Afro-Cuban rhythms with rhythm and blues. The most explicit is 'Longhair's Blues Rhumba,' where he overlays a straightforward blues with a clave rhythm." Longhair's particular style was known locally as rumba-boogie. In his "Mardi Gras in New Orleans," the pianist employs the 2–3 clave onbeat/offbeat motif in a rumba boogie "guajeo". The syncopated, but straight subdivision feel of Cuban music (as opposed to swung subdivisions) took root in New Orleans R&B during this time. Alexander Stewart states that the popular feel was passed along from "New Orleans—through James Brown's music, to the popular music of the 1970s," adding: "The singular style of rhythm & blues that emerged from New Orleans in the years after World War II played an important role in the development of funk. In a related development, the underlying rhythms of American popular music underwent a basic, yet generally unacknowledged transition from triplet or shuffle feel to even or straight eighth notes. Concerning the various funk motifs, Stewart states that this model "...is different from a time line (such as clave and tresillo) in that it is not an exact pattern, but more of a loose organizing principle." Johnny Otis released the R&B mambo "Mambo Boogie" in January 1951, featuring congas, maracas, claves, and mambo saxophone guajeos in a blues progression. Ike Turner recorded "Cubano Jump" (1954) an electric guitar instrumental, which is built around several 2–3 clave figures, adopted from the mambo. The Hawketts, in "Mardi Gras Mambo" (1955) (featuring the vocals of a young Art Neville), make a clear reference to Perez Prado in their use of his trademark "Unhh!" in the break after the introduction. 3–2 clave written in two measures in cut-time. The "Bo Diddley beat" (1955) is perhaps the first true fusion of 3–2 clave and R&B/rock 'n' roll. Bo Diddley has given different accounts of the riff's origins. Sublette asserts: "In the context of the time, and especially those maracas [heard on the record], 'Bo Diddley' has to be understood as a Latin-tinged record. A rejected cut recorded at the same session was titled only 'Rhumba' on the track sheets." Johnny Otis' "Willie and the Hand Jive" (1958) is another example of this successful blend of 3–2 clave and R&B. Otis used the Cuban instruments claves and maracas on the song. At first, only African Americans were buying R&B discs. According to Jerry Wexler of Atlantic Records, sales were localized in African-American markets; there was no white sales nor white radio play. During the early 1950s, more white teenagers started to become aware of R&B and to purchase the music. For example, 40% of 1952 sales at Dolphin's of Hollywood record shop, located in an African-American area of Los Angeles, were to whites. Eventually, white teens across the country turned their music taste towards rhythm and blues. Johnny Otis, who had signed with the Newark, New Jersey-based Savoy Records, produced many R&B hits in 1951, including: "Double Crossing Blues", "Mistrustin' Blues" and "Cupid's Boogie", all of which hit number one that year. Otis scored ten top ten hits that year. Other hits include: "Gee Baby", "Mambo Boogie" and "All Nite Long". The Clovers, a vocal trio who sang a distinctive sounding combination of blues and gospel, had the number five hit of the year with "Don't You Know I Love You" on Atlantic. Also in July 1951, Cleveland, Ohio DJ Alan Freed started a late-night radio show called "The Moondog Rock Roll House Party" on WJW (850 AM). Freed's show was sponsored by Fred Mintz, whose R&B record store had a primarily African American clientele. Freed began referring to the rhythm and blues music he played as "rock and roll". Ruth Brown was known as the "Queen of R&B"
Ruth Brown on the Atlantic label, placed hits in the top five every year from 1951 through 1954: "Teardrops from My Eyes", "Five, Ten, Fifteen Hours", "(Mama) He Treats Your Daughter Mean" and "What a Dream". Faye Adams's "Shake a Hand" made it to number two in 1952. In 1953, the R&B record-buying public made Willie Mae Thornton's original recording of Leiber and Stoller's "Hound Dog" the number three hit that year. Ruth Brown was very prominent among female R&B stars; her popularity was most likely derived because of "her deeply rooted vocal delivery in African American tradition"  That same year The Orioles, a doo-wop group, had the #4 hit of the year with "Crying in the Chapel". At Chess Records in the spring of 1955, Bo Diddley's debut record "Bo Diddley"/"I'm a Man" climbed to number two on the R&B charts and popularized Bo Diddley's own original rhythm and blues clave-based vamp that would become a mainstay in rock and roll. At the urging of Leonard Chess at Chess Records, Chuck Berry had reworked a country fiddle tune with a long history, entitled "Ida Red". The resulting "Maybellene" was not only a number three hit on the R&B charts in 1955, but also reached into the top 30 on the pop charts. Alan Freed, who had moved to the much larger market of New York City in 1954, helped the record become popular with white teenagers. Freed had been given part of the writers' credit by Chess in return for his promotional activities; a common practice at the time. In 1956, an R&B "Top Stars of '56" tour took place, with headliners Al Hibbler, Frankie Lymon and the Teenagers, and Carl Perkins, whose "Blue Suede Shoes" was very popular with R&B music buyers. Some of the performers completing the bill were Chuck Berry, Cathy Carr, Shirley & Lee, Della Reese, the Cleftones, and the Spaniels with Illinois Jacquet's Big Rockin' Rhythm Band. Cities visited by the tour included Columbia, South Carolina, Annapolis, Maryland, Pittsburgh, Pennsylvania, Syracuse, Rochester and Buffalo, New York, into Canada, and through the mid Western US ending in Texas. In Columbia the concert ended with a near riot as Perkins began his first song as the closing act. Perkins is quoted as saying, "It was dangerous. Lot of kids got hurt. There was a lot of rioting going on, just crazy, man! The music drove 'em insane." In Annapolis 70,000 to 50,000 people tried to attend a sold out performance with 8,000 seats. Roads were clogged for seven hours. Film makers took advantage of the popularity of "rhythm and blues" musicians as "rock n roll" musicians beginning in 1956. Little Richard, Chuck Berry, Fats Domino, Big Joe Turner, the Treniers, the Platters, the Flamingos, all made it onto the big screen. Two Elvis Presley records made the R&B top five in 1957: "Jailhouse Rock"/"Treat Me Nice" at number one, and "All Shook Up" at number five, an unprecedented acceptance of a non-African American artist into a music category known for being created by blacks. Nat King Cole, also a jazz pianist who had two hits on the pop charts in the early 1950s ("Mona Lisa" at number two in 1950 and "Too Young" at number one in 1951), had a record in the top five in the R&B charts in 1958, "Looking Back"/"Do I Like It". In 1959, two black-owned record labels, one of which would become hugely successful, made their debut: Sam Cooke's Sar, and Berry Gordy's Motown Records. Brook Benton was at the top of the R&B charts in 1959 and 1960 with one number-one and two number-two hits. Benton had a certain warmth in his voice that attracted a wide variety of listeners, and his ballads led to comparisons with performers such as Nat King Cole, Frank Sinatra and Tony Bennett. Lloyd Price, who in 1952 had a number one hit with "Lawdy Miss Clawdy" regained predominance with a version of "Stagger Lee" at number one and "Personality" at number five for in 1959. The white bandleader of the Bill Black Combo, Bill Black, who had helped start Elvis Presley's career and was Elvis's bassist in the 1950s, was popular with black listeners. Ninety percent of his record sales were from black people, and his "Smokie, Part 2" (1959) rose to the number one position on black music charts. He was once told that "a lot of those stations still think you're a black group because the sound feels funky and black." Hi Records did not feature pictures of the Combo on early records. Sam Cooke's number five hit "Chain Gang" is indicative of R&B in 1960, as is pop rocker Chubby Checker's number five hit "The Twist". By the early 1960s, the music industry category previously known as rhythm and blues was being called soul music, and similar music by white artists was labeled blue eyed soul. Motown Records had its first million-selling single in 1960 with the Miracles' "Shop Around", and in 1961, Stax Records had its first hit with Carla Thomas' "Gee Whiz (Look at His Eyes)". Stax's next major hit, The Mar-Keys' instrumental "Last Night" (also released in 1961) introduced the rawer Memphis soul sound for which Stax became known. In Jamaica, R&B influenced the development of ska. In 1969 black culture and rhythm and blues reached another great achievement when the Grammys first added the Rhythm and Blues category, giving academic recognition to the category. By the 1970s, the term "rhythm and blues" was being used as a blanket term for soul, funk, and disco. Around the same time, mods band influenced by R&B. The Who played Motown hit "Heat Wave". In the 70s, Philadelphia International (featuring The O'Jays, Harold Melvin & the Blue Notes, Jerry Bell, Archie Bell & The Drells and Billy Paul) and Hi Records (featuring Al Green, O. V. Wright and Ann Peebles) got R&B hits. In the late 1980s and early 1990s, hip-hop started to capture the imagination of America's youth. R&B started to become homogenized, with a group of high-profile producers responsible for most R&B hits. It was hard for R&B artists of the era to sell their music or even have their music heard because of the rise of hip-hop, but some adopted a "hip-hop" image, were marketed as such, and often featured rappers on their songs. Newer artists such as Usher, R. Kelly, Janet Jackson, TLC, Aaliyah, Beyoncé, Christina Aguilera and Mary J. Blige, enjoyed success. L.A. Reid, the CEO of LaFace Records, was responsible for some of R&B's greatest successes in the 1990s in the form of Usher, TLC and Toni Braxton. Later, Reid successfully marketed Boyz II Men. In 2004, 80% of the songs that topped the R&B charts, were also on top of the Hot 100. That period was the all-time peak for R&B and hip hop on the Billboard Hot 100, and on Top 40 Radio. From about 2005 to 2013, R&B sales declined. However; since 2010 Hip-Hop has started to take from the R&B sound choosing to adopt a softer smoother sound incorporating that of traditional R&B with rappers such as Drake and Fetty Wap who have opened an entire new door for the genre. This sound has gained in popularity and created great controversy for both hip-hop and R&B in how to identify it. British rhythm and blues and blues rock developed in the early 1960s, largely as a response to the recordings of American artists, often brought over by African American servicemen stationed in Britain during the Cold War, or merchant seamen visiting ports such as London, Liverpool, Newcastle upon Tyne and Belfast. Many bands, particularly in the developing London club scene, tried to emulate black rhythm and blues performers, resulting in a "rawer" or "grittier" sound than the more popular "beat groups". Initially developing out of the trad jazz, skiffle and folk club scenes, early artists tended to focus on major blues performers and standard forms, particularly blues rock musician Alexis Korner, who acted as a mentor to members of the Rolling Stones, the Yardbirds, Manfred Mann, the Graham Bond Organisation and the Kinks. Although this "purist" interest in the blues would influence major British rock musicians, including Eric Clapton, Jeff Beck, Peter Green and Jimmy Page, other artists adopted an interest in a wider range of rhythm and blues styles. Most successful were the Rolling Stones, whose first eponymously titled album in 1964 largely consisted of rhythm and blues songs. 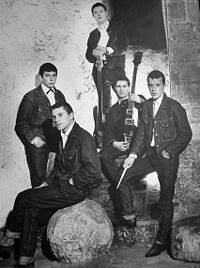 They soon established themselves as the second most popular UK band (after the Beatles) and led a second wave of the "British Invasion" of the US pop charts. In addition to Chicago blues numbers, the Rolling Stones also covered songs by Chuck Berry and Bobby and Shirley Womack, with the latter's "It's All Over Now", giving them their first UK number one in 1964. Blues songs and influences continued to surface in the Rolling Stones' music in later years. Other London-based bands included the Yardbirds, the Kinks, Manfred Mann and the Pretty Things, beside more jazz-influenced acts like the Graham Bond Organisation, Georgie Fame and Zoot Money. Bands to emerge from other major British cities included the Animals from Newcastle upon Tyne, and Spencer Davis Group from Birmingham, and Them from Belfast. None of these bands played exclusively rhythm and blues, but it remained at the core of their early albums. The music of the British mod subculture grew out of rhythm and blues and later soul, performed by artists that were not available to the small London clubs where the scene originated. As a result, a number of bands emerged to fill this gap, including Small Faces, and most successfully the Who. The Who's early promotional material tagged them as producing "maximum rhythm and blues", but by about 1966 they moved from attempting to emulate American R&B to producing songs that reflected the Mod lifestyle. Many of these bands enjoyed national success in the UK, but found it difficult to break into the American market.. But British White blues musicians could not play real R&B, and UK black musician such as Carl Douglas, Hot Chocolate(UK), Delegation, Junior, Central Line played real R&B and had hits. The British R&B bands produced music which was very different in tone from that of African-American artists, often with more emphasis on guitars and sometimes with greater energy. They have been criticized for exploiting the massive catalogue of African-American music, but it has also been noted that they both popularized that music, bringing it to British, world and in some cases American audiences, and helped to build the reputation of existing and past rhythm and blues artists. Most of these bands rapidly moved on from recording and performing American standards to writing and recording their own music, often leaving their R&B roots behind. Many helped pioneer psychedelic, and eventually progressive and hard rock, having a major influence on the nature and sound of rock music, making rhythm and blues a major component of its sound. ^ a b Palmer, Robert (July 29, 1982). Deep Blues: A Musical and Cultural History of the Mississippi Delta (paperback ed.). Penguin. p. 146. ISBN 978-0-14-006223-6. ^ a b "R&B". Kustom Beats. Archived from the original on March 15, 2012. Retrieved July 13, 2012. ^ a b Frere-Jones, Sasha (April 3, 2006). "On Top: Mariah Carey's record-breaking career". The New Yorker. CondéNet. Archived from the original on April 20, 2006. Retrieved August 30, 2008. ^ Jarret, Michael (October 6, 1998). "Whitney Houston Syndrome". Sound Tracks: A Musical ABC. ISBN 978-1-56639-641-7. ^ "'Vision of Love' sets off melisma trend". The Village Voice. February 4, 2003. ^ "The 100 Greatest Singer of All Time : Rolling Stone". Rolling Stone. November 12, 2008. Archived from the original on December 1, 2008. Retrieved November 22, 2008. ^ Sacks, Leo (August 29, 1993). "The Soul of Jerry Wexler". The New York Times. Retrieved January 11, 2007. ^ a b c d e Cohn, Lawrence; Aldin, Mary Katherine; Bastin, Bruce (September 1993). Nothing but the Blues: The Music and the Musicians. Abbeville Press. p. 314. ISBN 978-1-55859-271-1. ^ Whitburn, Joel (1996). Top R&B/Hip-Hop Singles: 1942–1995. Record Research. p. xii. ISBN 0-89820-115-2. ^ Rye, Howard. "Rhythm and Blues". Oxford Music Online. Retrieved July 20, 2014. ^ Palmer, Robert (September 19, 1995). Rock & Roll: An Unruly History. Harmony. p. 8. ISBN 978-0-517-70050-1. ^ Palmer, Robert (May 21, 1981). Deep Blues: A Musical and Cultural History of the Mississippi Delta. Viking Adult. ISBN 978-0-670-49511-5. ^ a b "Tad Richards, "Rhythm and Blues", St. James Encyclopedia of Pop Culture". Findarticles.com. January 29, 2002. Archived from the original on December 7, 2009. Retrieved April 20, 2012. ^ "Hot R&B/Hip-Hop Songs 1947". Billboard. Archived from the original on December 11, 2007. Retrieved December 23, 2007. ^ "Louis Jordan at All About Jazz". Allaboutjazz.com. Archived from the original on May 13, 2009. Retrieved January 7, 2010. ^ "The Vocal Group Harmony Web Site". Vocalgroupharmony.com. Retrieved April 20, 2012. ^ "Hot R&B/Hip-Hop Songs 1948". Billboard. Archived from the original on December 11, 2007. Retrieved December 23, 2007. ^ "Hucklebuck!". Wfmu.org. Retrieved April 20, 2012. ^ "Hucklebuck!". Wfmu.org. December 15, 1948. Retrieved April 20, 2012. ^ "– Year End Charts – Year-end Singles – Hot R&B/Hip-Hop Songs". Billboard.com. Archived from the original on June 5, 2011. Retrieved April 20, 2012. ^ "[Afro]-Latin rhythms have been absorbed into black American styles far more consistently than into white popular music, despite Latin music's popularity among whites" (Roberts The Latin Tinge 1979: 41). ^ Roberts, John Storm (1999: 16) Latin Jazz. New York: Schirmer Books. ^ Morton, "Jelly Roll" (1938: Library of Congress Recording): "Now in one of my earliest tunes, 'New Orleans Blues,' you can notice the Spanish tinge. In fact, if you can't manage to put tinges of Spanish in your tunes, you will never be able to get the right seasoning, I call it, for jazz." The Complete Recordings By Alan Lomax. ^ Kubik, Gerhard (1999: 52). Africa and the Blues. Jackson, MI: University Press of Mississippi. ^ "Wynton Marsalis part 2." 60 Minutes. CBS News (June 26, 2011). ^ Schuller, Gunther (1968: 19) "It is probably safe to say that by and large the simpler African rhythmic patterns survived in jazz . . . because they could be adapted more readily to European rhythmic conceptions. Some survived, others were discarded as the Europeanization progressed. It may also account for the fact that patterns such as [tresillo have] . . . remained one of the most useful and common syncopated patterns in jazz." Early Jazz; Its Roots and Musical Development. New York: Oxford Press. ^ "RHUMBOOGIE – Lyrics – International Lyrics Playground". Lyricsplayground.com. ^ Palmer, Robert (1981: 247). Deep Blues. New York: Penguin Books. ^ Palmer, Robert (1995: 60). An Unruly History of Rock & Roll. New York: Oxford University Press. ^ Dave Bartholomew quoted by Palmer, Robert (1988: 27) "The Cuban Connection" Spin Magazine Nov.
^ Kubik (1999 p. 51). ^ Palmer, Robert (1979: 14). A Tale of Two Cities: Memphis Rock and New Orleans Roll. Brooklyn. ^ Stewart, Alexander (2000: 298). "Funky Drummer: New Orleans, James Brown and the Rhythmic Transformation of American Popular Music." Popular Music, v. 19, n. 3. October 2000, p. 293-318. ^ Stewart (2000 p. 293). ^ Stewart (2000 p. 306). ^ Boggs, Vernon (1993 pp. 30–31). "Johnny Otis R&B/Mambo Pioneer" Latin Beat Magazine. v. 3 n. 9. Nov.
^ Stewart, Alexander (2000 p. 307). "Funky Drummer: New Orleans, James Brown and the Rhythmic Transformation of American Popular Music." Popular Music, v. 19, n. 3. October 2000, pp. 293–318. ^ a b Sublette, Ned (2007 p. 83). ^ Peñalosa, David (2010 p. 174). The Clave Matrix; Afro-Cuban Rhythm: Its Principles and African Origins. Redway, California: Bembe Inc. ISBN 1-886502-80-3. ^ Roberts, John Storm (1999 p. 136).The Latin Tinge. Oxford University Press. ^ Sublette, Ned (2007 p. 69). ^ Szatmary, David P. (2014). Rockin' in Time. New Jersey: Pearson. p. 16. ^ a b "– Biography: Johnny Otis". Billboard.com. Retrieved April 20, 2012. ^ a b Gilliland 1969, show 3, track 2. ^ "The Vocal Groups". History-of-rock.com. Retrieved April 20, 2012. ^ "Clovers Don't You Know I Love You & Other Favorites CD". Cduniverse.com. May 11, 2004. Retrieved April 20, 2012. ^ "Kevin Smith Librarry : Case Western Reserve University : Search Results : Mintz". Library.case.ueu. Archived from the original on February 3, 2014. Retrieved May 21, 2014. ^ "Buzzard Audio – The Buzzard: Inside the Glory Days of WMMS and Cleveland Rock Radio — A Memoir – Page 4". buzzardbook.wordpress.com. ^ Gilliland 1969, show 6, track 2. ^ White, Charles. (2003), p. 231. The Life and Times of Little Richard: The Authorised Biography. Omnibus Press. ^ Gilliland 1969, show 7, track 4. ^ Floyd, Samuel Jr. (1995). The Power of Black Music. Oxford University Press. p. 177. ^ "Hot R&B/Hip-Hop Songs 1953". Billboard. Archived from the original on December 11, 2007. Retrieved December 23, 2007. ^ "The Orioles Record Label Shots". Retrieved December 23, 2007. ^ Gilliland 1969, show 6, track 3. ^ Gilliland 1969, show 15. ^ Gilliland 1969, show 4, track 5. ^ Gilliland 1969, show 3, track 5. ^ Gilliland 1969, show 5, track 5. ^ "– Biography – Chuck Berry". Billboard.com. Retrieved April 20, 2012. ^ "Hot R&B/Hip-Hop Songs 1957". Billboard. Archived from the original on December 11, 2007. Retrieved December 23, 2007. ^ Gilliland 1969, show 22, tracks 3–4. ^ Palmer, Robert (September 19, 1995). Rock & Roll: An Unruly History. Harmony. p. 82. ISBN 978-0-517-70050-1. ^ Simon, Tom. "Brook Benton Biography". Retrieved December 23, 2007. ^ "Billboard.com – Year End Charts – Year-end Singles – Hot R&B;/Hip-Hop Songs". Web.archive.org. June 18, 2009. Retrieved December 9, 2018. ^ "Hot R&B/Hip-Hop Songs 1959". Billboard. Archived from the original on June 18, 2009. Retrieved December 23, 2007. ^ "Hot R&B/Hip-Hop Songs 1960". Billboard. Archived from the original on December 11, 2007. Retrieved December 23, 2007. ^ Gilliland 1969, show 52. ^ Gilliland 1969, show 25. ^ Palmer, Robert (September 19, 1995). Rock & Roll: An Unruly History. Harmony. p. 83,84. ISBN 978-0-517-70050-1. ^ "Sample of "Gee Whiz"". Music.barnesandnoble.com. Retrieved May 21, 2014. ^ "Mar-Keys – Last Night – Billboard Top 100 – 1961 – Top Billboard – mp3 song hits download full albums in mp3". Mp3fiesta.com. Retrieved February 1, 2018. ^ "allmusic". AllMusic. Retrieved January 7, 2010. ^ "The Origins of Ska, Reggae and Dub Music". Potentbrew.com. August 3, 1999. Retrieved January 7, 2010. ^ "The Beginning". Web.fccj.edu. Archived from the original on May 12, 2008. Retrieved January 7, 2010. ^ Cahoon, Brad (December 11, 2014). "Rhythm and Blues Music: Overview". New Georgia Encyclopedia. Retrieved February 13, 2017. ^ "I Can't Stand The Rain by Ann Peebles". Songfacts.com. Retrieved December 9, 2018. ^ "THE CHANGING FACE OF R&B". www.bluesandsoul.com. Retrieved November 3, 2015. ^ "100 & Single: The R&B/Hip-Hop Factor In The Music Business's Endless Slump". Village Voice. Retrieved November 3, 2015. ^ says, ChgoSista. "The Sacrifice of R&B". Soul Train. Retrieved November 3, 2015. ^ Vickie Cox Edmondson (July 18, 2008). "A preliminary review of competitive reactions in the hip‐hop music industry: Black American entrepreneurs in a new industry". Management Research News. 31 (9): 637–649. doi:10.1108/01409170810898536. ISSN 0140-9174. ^ R. F. Schwartz, How Britain Got the Blues: the Transmission and Reception of American Blues Style in the United Kingdom (Aldershot: Ashgate, 2007), ISBN 0-7546-5580-6, p. 28. ^ Gilliland 1969, show 27. ^ a b c d e f g h i j k V. Bogdanov, C. Woodstra and S. T. Erlewine, All Music Guide to Rock: the Definitive Guide to Rock, Pop, and Soul (Milwaukee, WI: Backbeat Books, 3rd edn., 2002), ISBN 0-87930-653-X, pp. 1315–1316. ^ Gilliland 1969, show 30. ^ Bill Wyman, Rolling With the Stones (DK Publishing, 2002), ISBN 0-7894-9998-3, p. 137. ^ Gilliland 1969, show 29, track 3. ^ a b c d V. Bogdanov, C. Woodstra and S. T. Erlewine, All Music Guide to Rock: the Definitive Guide to Rock, Pop, and Soul (Milwaukee, WI: Backbeat Books, 3rd edn., 2002), ISBN 0-87930-653-X, pp. 1321–1322. ^ "British Jazz-Funk". Criticalminded.com. October 9, 2016. Retrieved December 9, 2018. Gilliland, John (1969). "The Tribal Drum: The rise of rhythm and blues" (audio). Pop Chronicles. University of North Texas Libraries. This page was last edited on 17 April 2019, at 00:51 (UTC).